Are Tamanu has a history going back hundreds of years. The land on which Tamanu Beach is built bears the traditional name 'Are Tamanu,' which means 'house of the mahogony tree'. In keeping with its traditional name, Tamanu Beach has 23 free-standing and air-conditioned bungalows featuring Tamanu floors and Cook Island style thatched roofs. 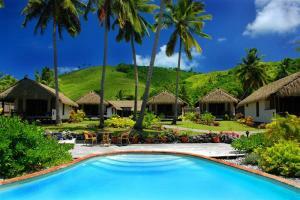 Tamanu is also used in the carvings in each room and the stunning poolside bar. The island of Aitutaki is considered to be home to one of the most beautiful lagoons in the world. Measuring 12km wide and 15 km long, its pristine waters hold a stunning array of marine life.